Data and Content Marketing, PRSSA with Mike Whaling of 30 Lines, 3/31 RECAPPED! The first and probably most important announcement – PRSSA IS PLAYING KICKBALL! And we’re competing against Ad Club on Wednesday, April 16th at 7 p.m. @ McCracken fields! Also, there’s still time to register for the Regional and PaRtner’s Conference with OSU! If your mom is in town this weekend for Mom’s Weekend, hurry and buy tickets to the Athens County Humane Society’s Woof & Wine event Friday night! Moms, free entertainment, and wine! What could be better? The ScrippsJSchool Instagram account will be holding an Instagram contest in the next couple weeks – keep an eye out for how you can participate! The member spotlight was Darby Fledderjohn! (@DFledderjohn). She an active member of PRSSA and ImPRessions and has just started doing freelance work for a corporate communications firm. After graduation, she’s going on vacation and then moving to New York! Congratulations and good luck! Jess Carnprobst had the chance to talk about AVW Productions, our ImPRessions spotlight for the night, who was recognized for AVW Week and the AVW Fair – nice job AVW! The speaker of the night was Mike Whaling of 30 Lines (@30Lines), a digital marking consultancy that helps businesses integrate their online marketing and build their brand. He has served as a tech advisor to Men’s Health Living Magazine and definitely knows his stuff when it comes to content marketing and data. He shared as much of his knowledge as he could fit into an hour! Mike explained how he believes that content and social are truly aligned today and how we must use it as an opportunity to spark conversation and create awareness about the brand. Social media is used today to host a lot of this conversation, and Mike showed PRSSA the Conversation Prism and described the many different ways we can share content. 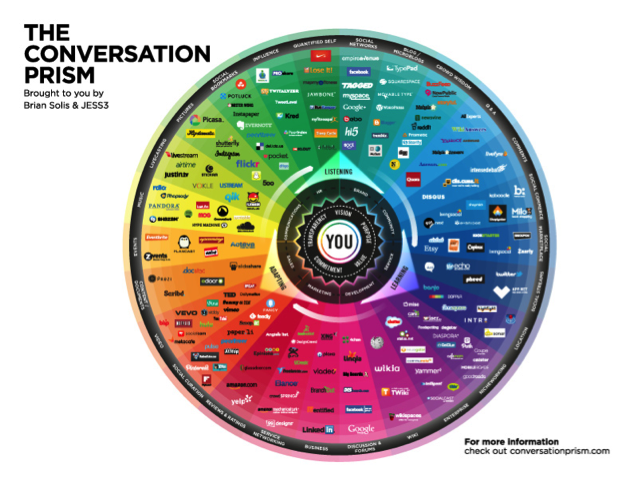 The conversation prism and questions like “What can you give your audience to talk about?” and “What’s the point of your brand and content?” can extend the reach of your brand overall. Mike also stressed that it’s important to reach out to your audience to inspire the content – use their photos or other content to match your blogs or posts. Social media is such an advantage when it comes to audience engagement! As the hour came to a close, Mike made sure we knew how important it is to have a goal in mind, so that you can use analytics tools like Google Analytics to measure the success of the reach and content. We learned that the average shoppers use an average of 10.7 sources of info to make a buying decision and the Zero Moment of Truth is a real thing – check it out at zeromomentoftruth.com! Overall, Mike gave us so much info on content marketing, analyzing data, and brand management. To find out more details from the members of Scripps PRSSA, check out the hashtag #ScrippsPRSSA! Thanks for entertaining and teaching us, Mike. Previous Post Open letter from our new professional adviser, Zach Wright!